Every few months we produce a 'batch' of several dozen sidecar chassis & mount sets to replenish our inventory. These are hand TIG welded with mill-cut joints, much like a fine bicycle frame. Many fixtures are used to ensure uniformity and critical components such as the swing arm and pivot plates of the chassis are finish machined after welding to ensure alignment. CNC equipped subcontractors are engaged to provide axles, clevises and other hardware produced to our drawings. When you place your order we issue a serial number and write up a 'build sheet' showing all the particular features of the sidecar that we will build. You receive a reference copy of this sheet. Your raw chassis & mounts are pulled from the existing inventory and sent out for powder coat, chrome, cad plating, anodize etc. At this time we order lights, wheel, tire, shock etc . per your order. Meanwhile a raw body/fender is pulled from stock and trimmed, drilled, sealed and prepped for paint. Our interior/upholstery/cover sets are ordered in batches from a marine upholstery subcontractor who has supplied us for years. If you have requested color matching - your paint work is scheduled with our painter (subcontractor). Paint work is perhaps the most labor intensive aspect of your sidecar build up. Each paint job involves expensive paint materials (epoxy primers, polyurethane colors & clear coats) and hours of preparation- blocking, priming, wet sanding, color coating, pin stripping (with paint! ), clear coating and polishing. There are no shortcuts in the process- just terrific quantities of hand labor and skill. 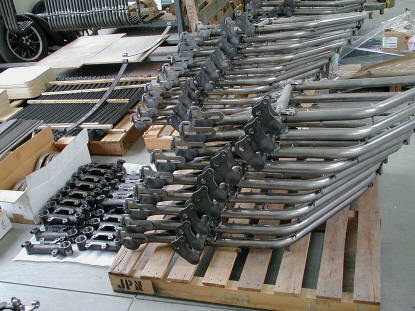 At a point 8-12 weeks from receiving your order, we will have all your particular components staged for final assembly. At this point - your finished sidecar takes shape in a matter of hours. Lights & trim are carefully fitted, the interior is installed and mounts are pre-assembled and packaged. Your custom built sidecar is rolled onto a specially built shipping pallet and a prefabed top crate is assembled around it. 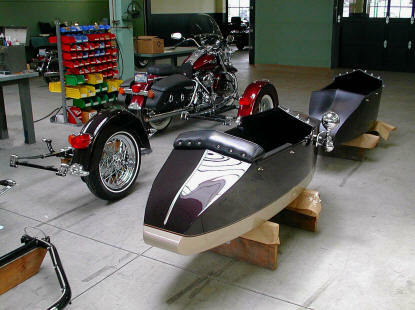 When your custom built Liberty Sidecar arrives by truck freight you will find a beautiful completely assembled unit- ready to install on your Harley Davidson®. Alternately, we are always pleased to mount & align your new sidecar here at our shops in Seattle. Please inquire about this option.